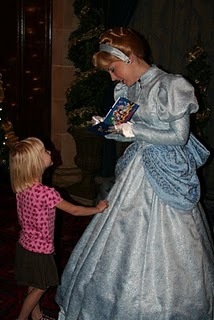 Monday was another Magic Kingdom day. We arrived at the gate prior to the Park open time so we could make it to our breakfast reservation . 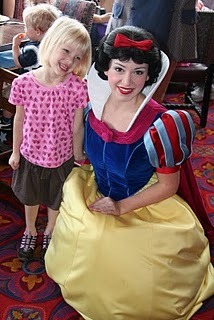 We were dining at the castle and Juliana wasn’t the only one looking forward this meal (I might have been a little excited to go to the castle as well). 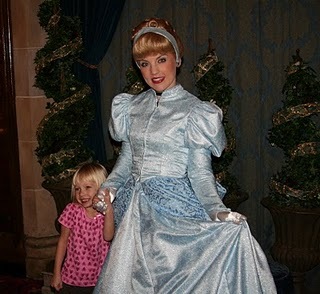 First we had Juliana’s picture taken with Cinderella and then we sat at our table upstairs. While the price was certainly no bargain, the food was very good. 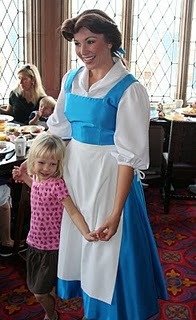 During breakfast, the princesses were announced and walked around to each of the tables: Belle, Sleeping Beauty, Jasmine and Snow White were all there. 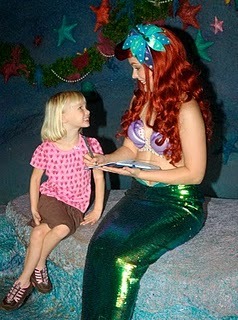 Keeping the princess theme going, Juliana insisted that we go straight to see Arial after leaving the castle. 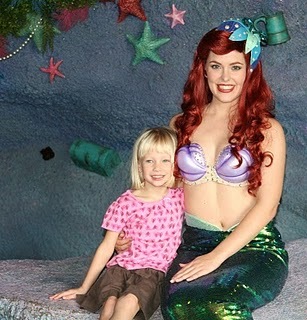 Arial and Belle were her favorites while we were there. Then we went on rides in Fantasyland and did some shopping before our lunch reservation at Liberty Tavern – one of my favorite restuarants at Disney. After lunch we got fast passes for Splash Mountain. 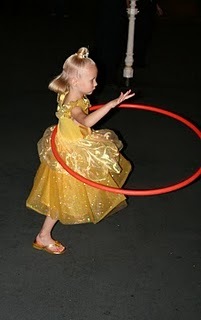 There is a small playgound near the ride and we let Juliana run around while we waited for our time slot. 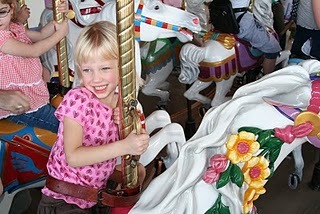 Juliana was in tears as we walked up to the ride – she wasn’t happy about getting wet or going down the big hill. But she calmed down and walked along the line. 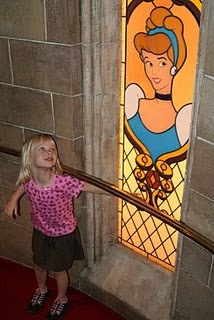 She liked the inside of the mountain with the music and characters but every little hill got her upset. She was quite happy when the last hill was over. We exited the ride just in time to watch the parade. After days of rain and cooler temps, this is the point when it drastically warmed up…as I was holding her up to watch the parade and the sun was beating down. That was a long 20 minutes. 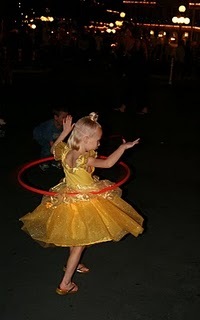 We had to waeve our way through the past-parade crowd back to the castle for Juliana’s appointment at the Boutique – I am going to add that to a separate post since there are so many pictures to include. After her appointment and photo shoot, we browsed through some stores. In the candy store Juliana was given a free bag of cotton candy since it was National Cotton Candy day. Then we waited at the end of Main Street for my mom. It was getting dark and they were getting ready for the parade. 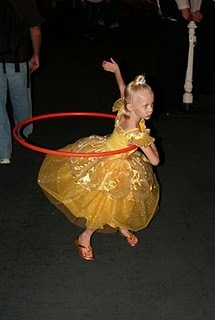 They have stations set-up with activites for kids as they wait along the parade route and they had hula hoops near us. 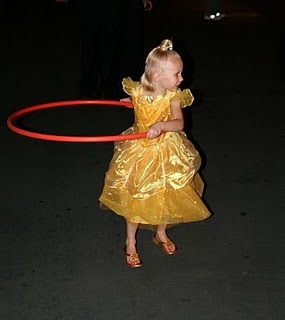 So we had a crazy hula-hooping princess for a little while. 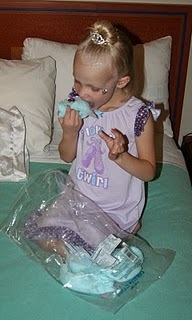 We got back to the hotel and Juliana changed out of her dress and ate some of her cotton candy. A little bit later my friend Sarah arrived. Sarah lives in Chicago and came to Dinsey to spend some time with us for her birthday. 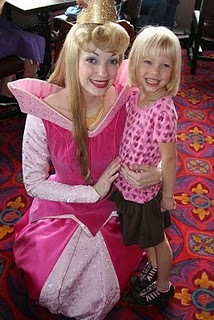 Disney is running a Celebration promotion (might have been 2009 only) and she got free admission to one Park on her birthday. Since we were already planning to be there, it was a perfect fit to get to spend some time together and celebrate her birthday. We had dinner at the hotel and then we carefully removed Juliana’s tiara in the hopes that her hair would stay mostly in place for the next day.